Yes, there is an AutoCAD Vault Add-in that provides access to Vault functions within the AutoCAD software. Details regarding managing AutoCAD designs using the AutoCAD Vault Add-in are shown later in the webcast. Yes, when opening a file, you have the option to check out a file or open it as read-only (view only). You are not required to save changes if you open it as read-only. The software used in the webcast is Autodesk Vault Professional 2019 with a login to a Vault Server, not cloud-based login. Q: ­­I am presently using AutoCAD Electrical/ Vault 2018. The 2019 Vault ribbon looks like changes have been made. What is Buzzsaw which I see several tabs for in Vault 2018? Q: So the ipj does not need to be checked out to work on the file? Correct. The project file needs to be downloaded using the Get command but does not need to be checked out in order to work on the Inventor file. Thank you again! If you have ideas or requests for future webcasts, please let us know. It is that time of year again when Autodesk releases their newest software versions! ASCENT has been busy preparing and getting our learning tools ready for you. There a couple of changes to our products we want to make you aware of for the new release. The first change you will see with the 2019 release is that we now use the term Learning Guide in place of Student Guide. This is a subtle change and came about simply because not everyone using our products is a student. Many people attend a class to learn these software products, but many people learn on their own. We feel Learning Guide is more representative of the wide range of users of our printed books and digital eBooks. Instructor Notes – An Instructor Notes section has been added at the beginning of the Instructor Guide to explain the specifics about the layout of the book to help instructors prepare. Instructor Presentation Slides (if available) – If instructor presentation slides are available for the title, a download link is provided directly in the Instructor Guide to download the slides that can be used as instructional aids for the course. Class Schedule – A suggested schedule for each chapter is included to help manage time while teaching. The entire class schedule is included in the Schedule section and we have also conveniently listed the chapter’s teaching time on the first page of each chapter. Practice Completion Times – An estimated time for completion of each practice exercise is provided in the margin adjacent to the objectives. This is intended to provide guidance on how long students need to work on the practice so you stay on schedule. These practice completion times appear only in the Instructor Guide, not in the Learning Guide. Answers to Review Questions – Instructors no longer need to reference the answer key in a separate Instructor Tools document. All answers to the review questions are now included in the margins of the Instructor Guide, adjacent to the question. The Learning Guides continue to be available in print and eBook formats, and now we offer the Instructor Guides in these formats too. And don’t worry, the page numbering will be consistent between the Learning Guides and the corresponding Instructor Guides. We hope that you like the new format and please let us know if you have any questions. The Autodesk® 360 (A360) software is the direct connection to the Autodesk Cloud environment, which enables teams to work together and share information, and provides knowledge on how to display and edit a drawing file. Using A360, you can easily and conveniently share drawings with other team members. The cloud collaboration topic is discussed in detail in Chapter 10: Cloud Collaboration and 2D Automation in the AutoCAD 2018: Advanced - Mixed Units student guide. Sharing drawings with other team members in A360 is as easy as saving the drawing file and selecting A360 as the storage location in the Save in drop-down list. Additionally, you can click (Share Document) in the A360 tab>Share panel. You can also open files from the Cloud and attach files located in the Cloud using the Look in drop-down list and selecting the A360 option. After signing in to A360, in the A360 tab>Online Files panel, click (Open A360 Drive) to open the A360 browser. The browser displays a list of all available folders. Navigate into the folders to locate files as required. To upload one or more files at a time, click Upload in the A360 browser. Public sharing enables anyone that has the link to access the drawing. The link only enables you to display or download the drawing without giving them permission to make any changes. Private sharing enables you to share drawings with other users with whom you are actively working on projects. This enables them to display, download, and edit any drawings to which you provide access. The links are created in the Share dialog box. When you hover over a drawing name, various icons display that enable you to work with the file. These icons are described below. - Share: Enables you to share a link with other users so that they can access the file in A360. - Download: Enables you to download the file for local viewing and editing. - Expand: Expands to display a menu with options that enable you to move, copy, rename, upload a new version, or delete the file. To publish views of drawings to the cloud while protecting your drawing files, on the A360 tab>Share panel, click (Share Design View). This option enables stakeholders to view the design without having to log in to A360 or have the AutoCAD software installed on their computers. I hope that you will find the above feature useful for sharing your drawing with other team members. As previously mentioned, I have provided a fully detailed section on Sharing Designs in the Cloud collaboration along with a hands on practice in Chapter 10: Cloud Collaboration and 2D Automation in the AutoCAD 2018: Advanced - Mixed Units student guide. The Path Type Controls how the AutoCAD software searches for the reference file to load it. By default, the Path type is set to Relative Path. It starts from the folder of the host drawing. Full path uses the entire path. With No path, the AutoCAD software searches in the current folder of the host drawing, and in the project paths, support paths, and Start-in folder. When a drawing has an external reference that has been moved and cannot be found, the shortcut menu offers you options to find the file, as shown in Figure 31–9. The Select New Path option enables you to fix the missing path by selecting the file from the new location. Once the reference file’s new location has been selected, the software prompts you to use the new path for the other missing references or leave the rest of the paths as is. The Find and Replace option opens the Find and Replace dialog box, which enables you to find the current path and replace all of its instances with the new path, all at once. The shortcut menu also provides you with the option of changing the path type by selecting Change Path Type. If the path type option of the selected reference file is grayed out and cannot be selected, it indicates that it is the one currently used. Figure 31–10 shows an example of the referenced file using the Relative Path type, which is grayed out to indicate that the path type is currently used. Available in Mixed Units and Metric Units of Measurement. In the Express Tools tab>Text panel, use the Convert to Mtext tool (shown in Figure B–8) to combine multiple individual text objects to create one multi-line text object. When you start this command, you can select the individual single line text objects and then press <Enter>. In the Command Line, it displays the number of Text line objects that were converted to a single multiline object, as shown in Figure B–9. Before selecting the individual text lines, you can select the Settings option (<Down Arrow>) which opens the Text to MText Settings dialog box, as shown in Figure B–10. You can use the default Sort top-down setting, which sorts the collinear multiple text lines as they are on the same line with a space between them. If you clear the Combine into a single Mtext object option, the selected multiple single line text objects are converted to individual multi-line text objects, without combining them into one object. The Force uniform line spacing option keeps the existing line spacing between the individual text lines. This tool can be found in the 2018 ASCENT training guide: AutoCAD/AutoCAD LT 2018: Fundamentals. Solid View creates a viewport and several layers. The viewport is placed on the Vports layer, which is created if required. Each viewport is given a name. This name is used to create four layers per viewport: <name>-DIM (dimensions), <name>-HAT (hatching), <name>-HID (hidden lines), and <name>-VIS (visible lines). Do not put anything else on these layers (except for the layer Dimensions), because Solid Drawing automatically deletes and updates the information stored on them. You can change the color of any of the layers as required. Hatching created in sectional views uses the current values set in the Hatch command. Double-click on the hatching to modify it once it is in the drawing. Isolines are lines drawn on a curved surface to indicate that the surface exists. The Isolines variable controls how many isolines display on curved solids. The default value is 4. A larger number creates a more tightly curved object, as shown here. Silhouette edges (Dispsilh) are lines that indicate where a curved surface disappears from sight, as shown here. The Isolines and Dispsilh variables affect the plotting of shapes when the lines are hidden. 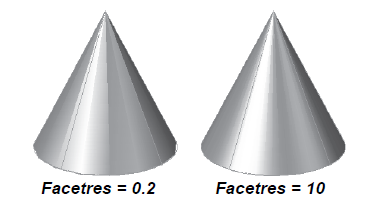 Facet resolution (Facetres) sets the smoothness of shaded and rendered objects, and objects with hidden lines removed, as shown here. Type Regen to display the change, as required. The Generic option uses default lighting without any lighting units. The International (lux) and American (foot candles) options enable photometric lighting. AutoCAD Tip: What is the Base Surface? In the Chamfer command, if you select an edge of a solid at the Select first line prompt, the AutoCAD software immediately prompts you to select a base surface and highlights one for you to accept or reject. The base surface is a plane that touches the edge you have selected. 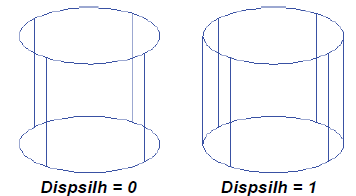 Every 3D edge has two possible base surfaces. The AutoCAD software suggests one by highlighting it. You can toggle between the two surfaces by using the Next option at the Enter surface selection option prompt. Point Clouds are dense groupings of points created by 3D scanners. As more firms use 3D scanners to capture existing conditions, it becomes more important for CAD users to learn how to take full advantage of the collected point cloud data. General AutoCAD has several tools that allow you to quickly create linework from point clouds. Additionally, AutoCAD Civil 3D can use point cloud data to create a terrain surface. The Autodesk ReCap software enables the creation of a point cloud project file (RCP) that references multiple indexed scan files (RCS). It converts scan file data into a point cloud format that can then be viewed and modified in other Autodesk software products. As with XREFs, images, and other externally referenced files, you can attach and manage point clouds using the External References Manager. Point cloud object snaps have been added to the 3D Object Snap tab in the Drafting Settings dialog box and the 3D Object Snap options in the Status Bar. In a point cloud, you can use the Object option in the UCS command to align the active UCS to a plane. Dynamic UCS now aligns to a point cloud plane according to point density and alignment. Point cloud transparency can be adjusted enabling you to see beyond the cluster of points. Attaching a point cloud is the same whether you are working in general AutoCAD or AutoCAD Civil 3D. In a webcast I did a few months ago, I showed how to work with point clouds when using the AutoCAD software. Click here below to watch the webcast recording now. In order to take that webcast a step further for AutoCAD Civil 3D users, here are the steps on how to turn point clouds into a terrain surface. How To: Create a Surface from Point Clouds in AutoCAD Civil 3D. In the Home tab > Create Ground Data panel, expand Surfaces and select (Create Surface from Point Cloud). In the model, select the point cloud or select any of the following options in the command line, as shown in the figure below. In the Create TIN Surface from Point Cloud dialog box - General page, type a surface name, set the surface style, and render material, as shown in in the figure below. Click Next>. In the Create TIN Surface from Point Cloud dialog box - Point Cloud Selection page, select the Point clouds or parts of the Point clouds, as shown in the figure below. Click Next>. In the Create TIN Surface from Point Cloud dialog box - Non-Ground Point Filtering page, select a filter method and click Create Surface, as shown in the figure below. In the Point Cloud Processing in Background message box, click Close. I want to hear from you. Are you using Point Clouds? If you have any examples you would like to share you can post them in the comments below.